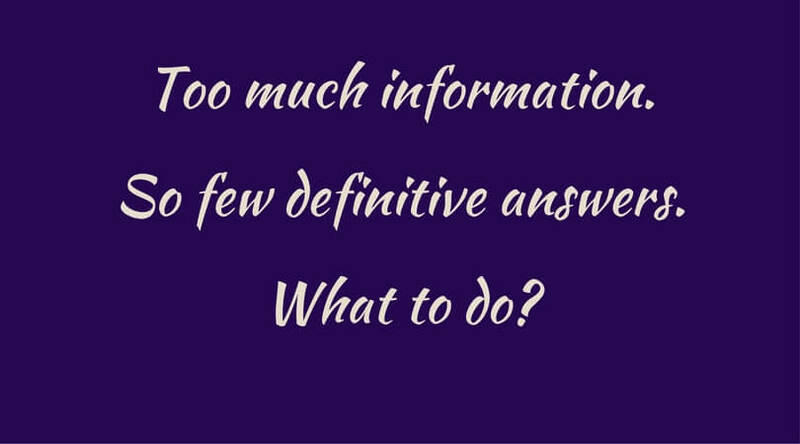 Information overload combined with a lack of clear answers can be confusing, frustrating, and discouraging. It’s tempting to think it would be so much easier if life were black and white, if someone else could tell us the precise course of action to guarantee the results we want. But that won’t be happening any time soon. And really, that isn’t the point of life, as far as I can tell. From my viewpoint, life is about learning and growing. And health issues certainly provide us with opportunities to do that. So it’s on us to be conscious and engaged when making health-related choices. Here are a few thoughts to consider. 1. We are organic, not mechanical, systems. Repairing a mechanical system is usually a straightforward, clear-cut, logical process. Not so with living systems, which are elegantly complex and sometimes incomprehensible. We have a capacity for emotion, interconnected body systems, and strong survival instincts. No wonder it’s challenging to zero in on the one correct thing to do. 2. It helps a lot to adopt an experimental mindset. Because maybe there isn’t just one perfect answer. Maybe it’s a zig-zag path to where we want to be. In this culture, we tend to look for a direct path to the right and perfect solution. This search can have the unintended consequence of preventing any action at all because you can never be really sure you’ve found the correct one. On the other hand, an experimental approach allows us to be curious. It opens up possibilities and gives you a chance to learn what works and what doesn’t. It’s a time-honoured approach, as illustrated by this story from Thomas Edison’s friend and associate Walter S. Mallory. With an attitude like that, there’s no need to feel like a failure when you try something that doesn’t work. After all, you were just testing a theory, not staking your reputation for success on it. 3. You’ll be a lot more confident in making health decisions once you learn to access your innate self-knowing. Self-knowing is the key to being able to rest easy with your decisions. It’s the aspect of decision-making that provides the greatest opportunity for growth, and the one that’s easiest to overlook. This entry was posted in Mindset, Viewpoints & Thinking for Ourselves, Making Decisions, All Posts—newest first and tagged making decisions, Thomas Edison, Delta Rhythm Boys, Undecided, organic systems, experimental mindset, health decisions by Laurana Rayne. Bookmark the permalink. Laurana, My husband Don has been on Synthroid for about 15 years. He was diagnosed with low thyroid because he was so tired. No other definite diagnosis. Since about 2012 he has had bad brainfog. The gerentologist has not found any problem with the brain scan , says he has no alzheimber’s and no meds for confusion and some anxiety. I still think we are missing something . Is there another way to enhance the thyroid action other than Synthroid.? Hi Maryl. Yes, there are alternatives to Synthroid, which is a brand of T4. It is also possible to get desiccated thyroid (which contains T1, T2, T3, T4). And T3, preferably time release, which you will need to get from a compounding pharmacy. A note about online research: American brands are different. When they refer to Armor Thyroid, think desiccated thyroid. Their T4 is Levothyroxin; our counterpart is Synthroid. For me, carbohydrates were also implicated in brain fog and I didn’t make that discovery until ten years later. I was also treated for ailing mitochondria. You’ll find more in my blogs from last summer. Kudos for following your instincts and pursuing it further. I hope this gives you a place to start. Feel free to be in touch if there’s anything else I can do.